Objectivism, with its roots in realism and essentialism, sees reality as external to the individual and disassociated from experience. Human behavior is predictable as they respond to an external world (stimuli) they can neither control nor understand without acquiring reliable knowledge. Knowledge can only be gained from publicly observable replicable facts, not from such subjective phenomena as intentions, values, interpretations and perceptions. This knowledge exists independently in the real, structured world that the mind can mirror. 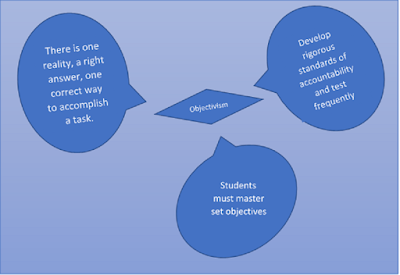 In terms of instruction objectivists believe that the reality and structure of the world can be modeled for the learner, and that all learners uniformly gain the same understanding. Teachers are expected to help students understand this “real” world and students are expected to replicate what they are taught not interpret their individual perceptions. Objectivists are therefore concerned with developing law-like rational knowledge to help individuals successfully navigate this “real” external world (Diesing, 1966, Huizing, 2007, Jonassen, 1991). Diesing, P. (1966). Objectivism vs subjectivism in the social sciences. Philosophy of Science. 33(1/2). 124-133. Jonassen, D. H. (1991). Objectivism versus constructivism: do we need a new philosophical paradigm? Educational Technology Research and Development. 39(3), 5-14.